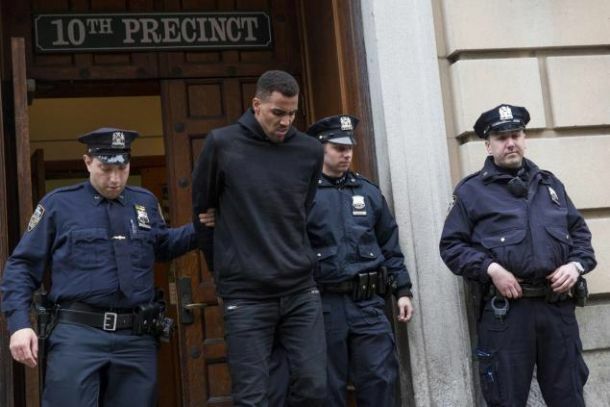 The legal battle between Atlanta Hawks swingman Thabo Sefolosha and the NYPD is far from over—Sefolosha is filing a lawsuit of up to $50 million against the city of New York and eight cops over what he calls “permanent” injuries from an arrest last April. Sefolosha, 31, was forced to sit out the Hawks’ postseason run after he was manhandled by the police. The 10-year NBA veteran was found not guilty of all criminal charges stemming from the arrest earlier this month. Thabo Sefolosha of the Atlanta Hawks says in a legal notice that the broken leg he suffered when cops pushed him to the ground outside celebrity hot spot 1Oak last April caused him to “become substantially disabled.” […] The physical “damages are permanent in nature and continuing into the future,” according to the notice of claim filed with the city’s comptroller. Sefolosha’s defense lawyer, Alex Spiro, said the player’s exceptional performance on the court doesn’t mean he wasn’t permanently injured. […] “Unfortunately, he may not be dunking as much as he was before this happened,” the attorney said. Got the drop on SlamOnline . . .